This is an almost-true colour composite based on images made with the multi-mode VIMOS instrument on the 8.2-m Melipal (Unit Telescope 3) of ESO's Very Large Telescope. This space wallpaper reveals an almost-true colour composite based on images made with the multi-mode VIMOS instrument on the 8.2-m Melipal (Unit Telescope 3) of ESO's Very Large Telescope. Exposures were taken in three different wavebands which were associated to a given colour : R-band (centred around 652 nm; red), V (540 nm; green) and B (456 nm; blue). The images were taken on the night of December 9 to 10, 2004 in the presence of the President of the Republic of Chile, M. Ricardo Lagos. The observing conditions were very good (seeing well below 1 arcsec). The total exposure was 2.25 min in R, 3 min in V and 6 min in B. The scale is 0.205 arcsec/pix and the image covers a 7.7 x 6.6 arcmin2 region on the sky. All exposures were taken and pre-processed by ESO Paranal Science Operation astronomers. 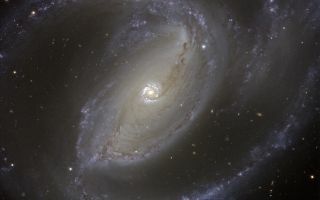 Additional image processing by Henri Boffin (ESO).